Pac-Man is still one of the most influential games of all time. 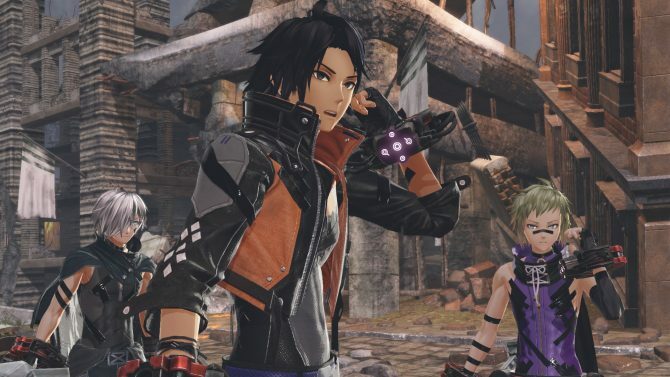 The game’s simplistic design, coupled with its approachable protagonist and rewarding game structure, continues to win over the hearts of many. When one is able to create a game that does all that, it is usually hard to break new ground and expand your IP. While the Pac-Man series has attempted to do this in different genres with Pac-Land, Pac-Man 2: The New Adventures, and Pac-Man World, his classic arcade titles are the ones that stood the test of time and are still iconic to many today. Back in 2007, Pac-Man Championship Edition showed there was still new life to be found in this classic formula, and luckily Pac-Man Championship Edition 2 continues this trend and is the most influential arcade-style Pac-Man game since the original. This game is is one of the most influential Pac-Man games in the series due to some radical changes made to its gameplay, though at its core, it still plays out like the original Pac-Man. The player is put in a maze with ghosts, and must eat a certain amount of pellets in order to complete the level. While some of these changes may be off-putting to gamers used to the series’ formula, they end up as great new additions to the Pac-Man series as a whole. In Pac-Man Championship Edition 2, the player is on a time limit, similar to the first game. 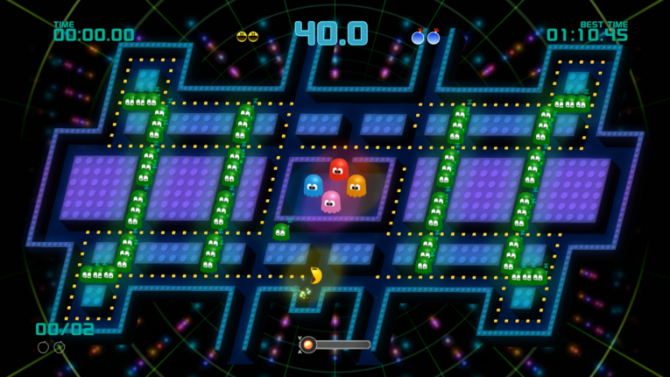 In the game’s modes, Pac-Man must eat enough pellets in order to fill up a gauge at the bottom of the screen. When this gauge is full, either a fruit or a power pellet will spawn at a “safe point” on the map. In specific cases, these items can actually run away from the player, causing you to chase them in order to move on. Pac-Man must eat this spawned item to either move on to the next level in the stage (fruit) or gain the ability to eat ghost trains and rack up points (power pellet). The player can easily return to the safe point with a bomb jump, which are limited, and if the player runs out of lives, it’s game over. As Pac-Man goes around the map, he will pass by little green ghost minions, which when woken will go behind one of the active ghosts and start forming a ghost train. The longer the ghost train, the more points gained from eating it once the player receives a power pellet. You can only start eating a ghost train if you start with the head ghost. 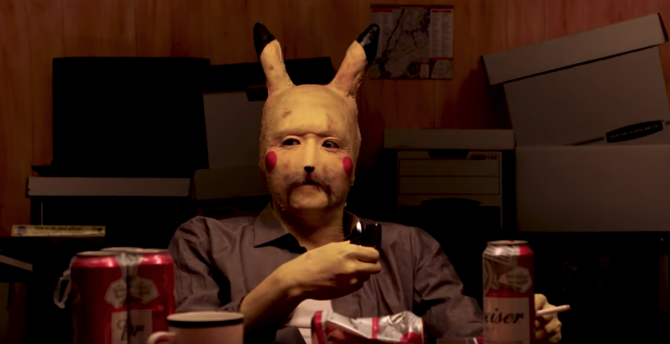 Luckily, when the power pellet is active, the ghosts possible routes are shown, adding a surprising layer of planning and strategy to the game due to the player anticipating the ghosts’ next moves. Eating a ghost train is also very satisfying, and always fun to watch when it is activated. The biggest change to the basic Pac-Man formula is that ghosts no longer kill you in one hit. Instead, the player has to bump into them three times in succession in order to anger them, and once angered, they gain the ability to kill Pac-Man. While this sounds like it would completely throw off the game’s balance, it actually works well with the game’s other mechanics. Due to the game’s fast pace, bouncing off ghosts makes traversing the map and passing ghost trains easier. 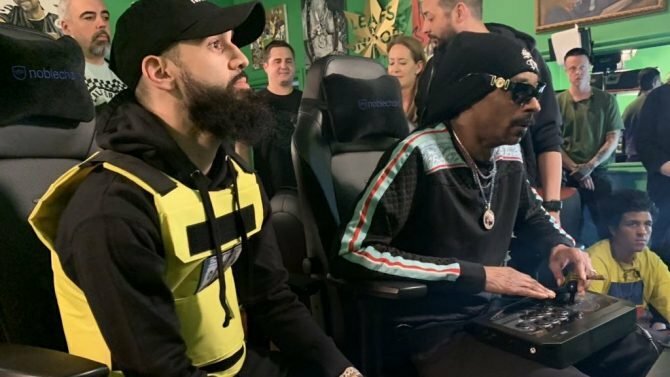 It also allow the player to plan better, as the player can chose to do such things as bump the ghost and send it up in the air in order to get past it. This concept turns one of Pac-Man’s most basic mechanics on its head, but it was executed in such a matter that it does not feel out of place at all, and flows well with the rest of the game. All of the game’s mechanics are taught to the player through a really detailed tutorial. This mode, which consists of eighteen levels, teaches players everything from basic mechanics such as movement and bomb jumping, to more advanced mechanics such as breaking and how to gain more speed when turning corners. This tutorial is great for both newcomers and series veterans, and teaches players this game’s unique mechanics in a very good way. The first of the game’s two main modes is Score Attack. In this mode, players are put into one of 10 levels: Championship II, Jumping, Hexagon, Highway, Dungeon, Mountain, Manhattan, Junction, Championship I, and Spiral. In these stages, players are on a five minute time limit, and must try to rack up as many points as possible in that time. There are three difficulty levels. Single Train is the easiest, and as the title implies, this only allows one ghost train. While this mode is easy, the player might not be able to rack up as many points because there is only one ghost train at any given time. The game shows how many points the player received and where they received them after the match ends, and that helps the player form future strategies. Next comes Regular, which is unlocked when players get a D rank or higher on a stage on Single Train. This difficulty level allows four ghost trains, and is more difficult than the previous mode. Regular is perfect for those who are used to the game’s mechanics. Finally, there is Extreme mode, which is unlocked when a player gets a B rank or higher on a stage on the Regular difficulty. Extreme, which also allows four ghost trains, is very difficult, and is only fit for those who have mastered the game’s controls. Score Attack is a great mode for players who just want to mess around and have fun with the game. Next is Adventure mode, which gives Pac-Man Championship Edition 2 more of a level based structure. 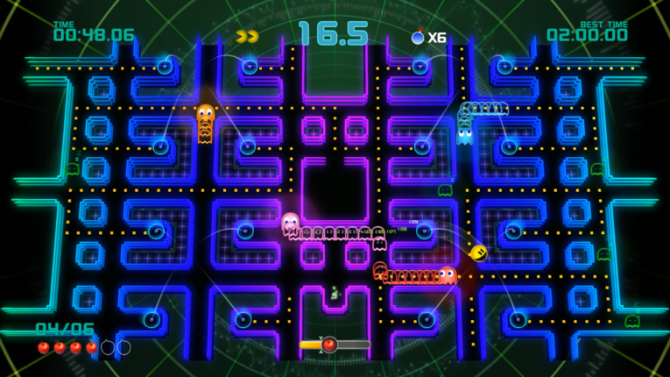 In this mode, Pac-Man must complete a level under certain parameters and time limits, such as clearing six stages in a short amount of time. If successful, players are rewarded with a star, and once they gain enough stars, they can unlock the boss level of that world. Once the boss is beaten, the player can move onto the next set of stages. Another big thing Pac-Man Championship Edition 2 adds to the traditional Pac-Man formula is bosses. 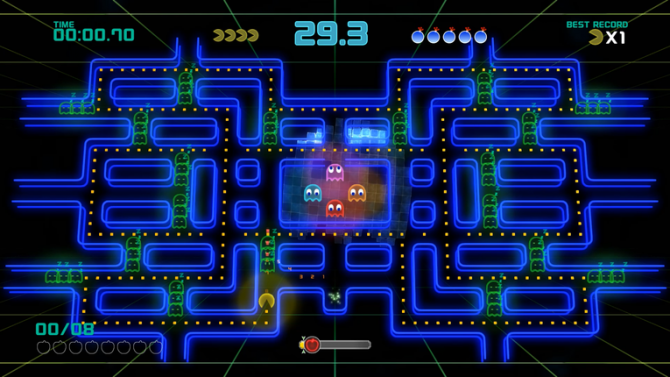 In certain levels in Adventure mode, Pac-Man is pitted against a giant ghost, which he has to beat in order to progress. 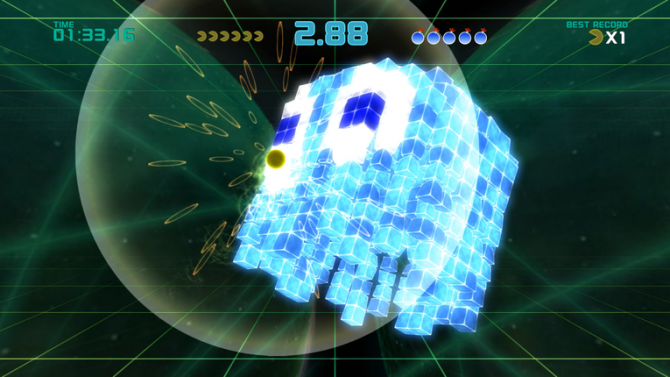 These ghosts aren’t faced head-on though, as the player still has to progress through a certain number of levels in the stage in order to defeat them. These giant ghosts can bump the stage at any time, causing enemies to go into an immediate state of anger. These fights are really stressful, but utterly satisfying when completed as Pac-Man devours the giant ghost. 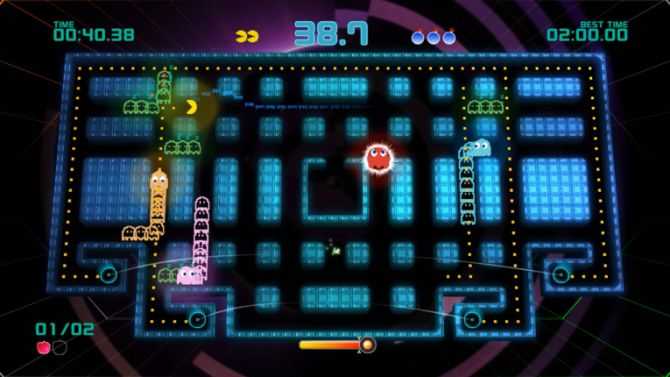 Pac-Man: Championship Edition 2’s biggest problems come with both its sound elements. The lack of sound effect to notify whether a fruit or a power pellet spawns can be confusing and disorienting to the player. While a sound effect plays when items drop, it is the same for both fruits and power pellets. A few times I kept eating pellets to build up my score even after a power pellet dropped because I assumed it was a fruit, not a power pellet that could give me massive points by eating a chain. 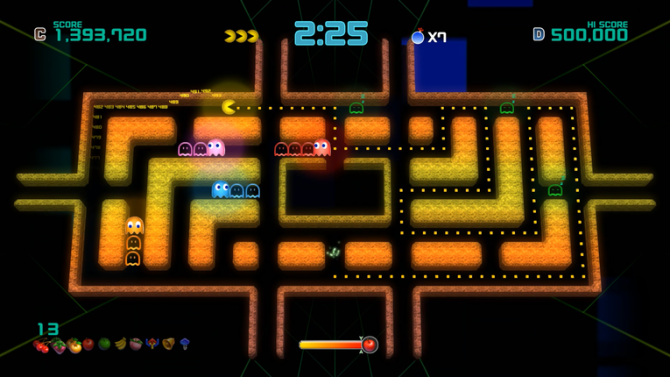 While it does show you which item is spawning at the bottom of the screen, taking one’s eyes off Pac-Man can be deadly. A different sound effect for when a power pellet drops would have made planning my next move easier in this fast-paced game. 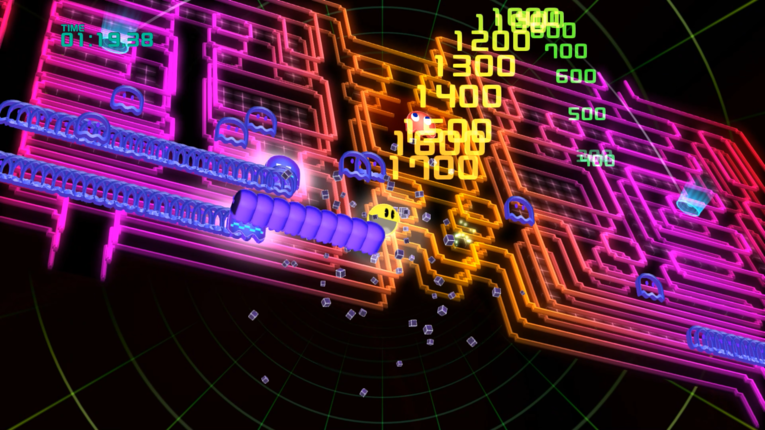 The game relies on electronic music for its soundtrack. While most of the music is fine, the main theme is ear-grating and very annoying to listen to due to its awkward sound beeps. This makes turning on the game and going through the menus a less enjoyable experience because the player has to hear the theme every time they start the game or want to go to a different. 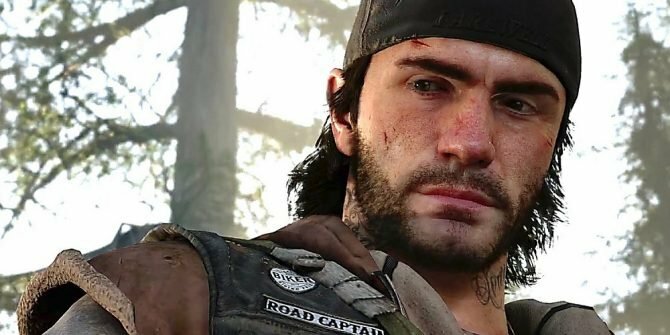 It is a shame that such a great game has to be buried under such as horrible song, messing up the game’s flow and impact as a result. Pac-Man Championship Edition 2 also allows for a lot of customization, especially in Score Attack. 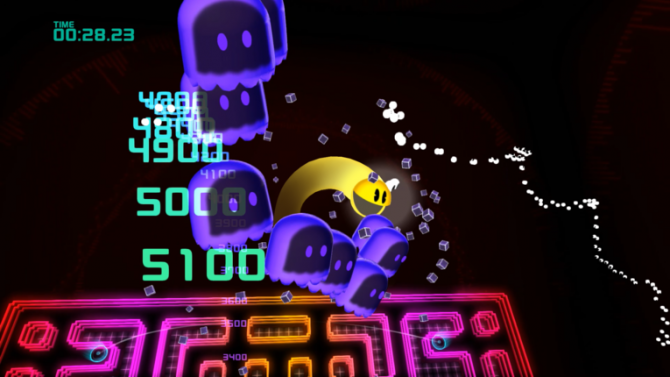 Different things such as camera angles, stage designs, backgrounds, and skins for Pac-Man and the ghosts can all be modified and change, making no two level playthroughs the same. 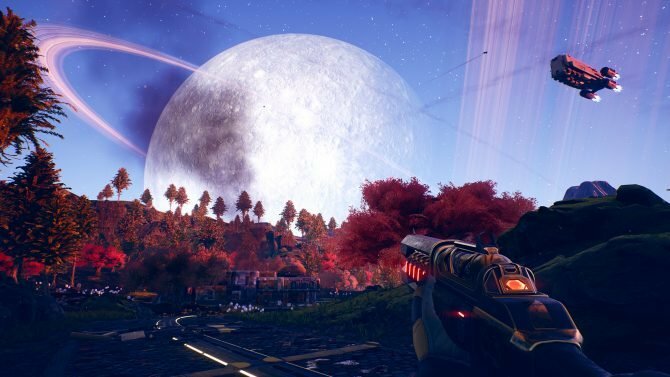 These changeable settings also can show off the game’s visual flair. While not as flashy as its predecessor, it still looks very good, especially when the game switches from 2D to 3D when the player eats a ghost train or defeats a boss. While not without a few minor sound problems, Pac-Man Championship Edition 2 is the definitive evolution of the Pac-Man series, adding enough new mechanics while improving the main game so much that the title is worth a purchase from any arcade game or Pac-Man fan. While some series veterans might not be a fan of the radical changes to this game’s gameplay, Pac-Man Championship Edition 2 shows that there is still a lot of life and innovation to be found in this 36 year old series. 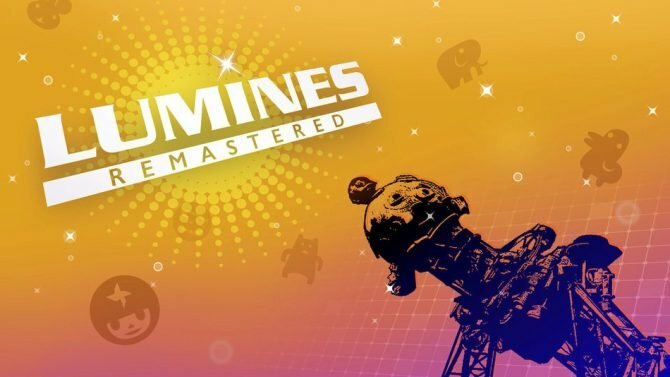 This game was truly the power pellet that the entire series needed, and now that it has been rejuvenated, I wouldn’t be surprised if Pac-Man sticks around for another 36 years.